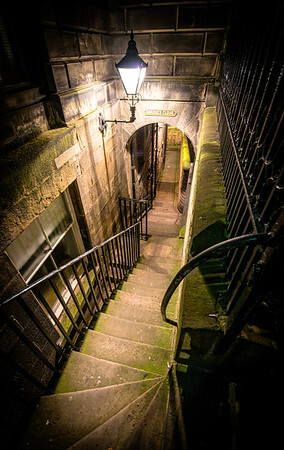 Barrie's Close is a very attractive little close just off the Royal Mile (behind St Giles' Cathedral). I didn't actually realise it was there for a few years as hadn't seen any pictures of it before and it's a bit out of the usual walking route (or any walking route!) going down the Royal Mile! I found getting this shot pretty awkward, getting the legs of my tripod tangled up in the slightly too high fence and dealing with groups of tourists (presumably) on ghost tours who insisted on standing just at the bottom of the stairs!